I love mushrooms always. 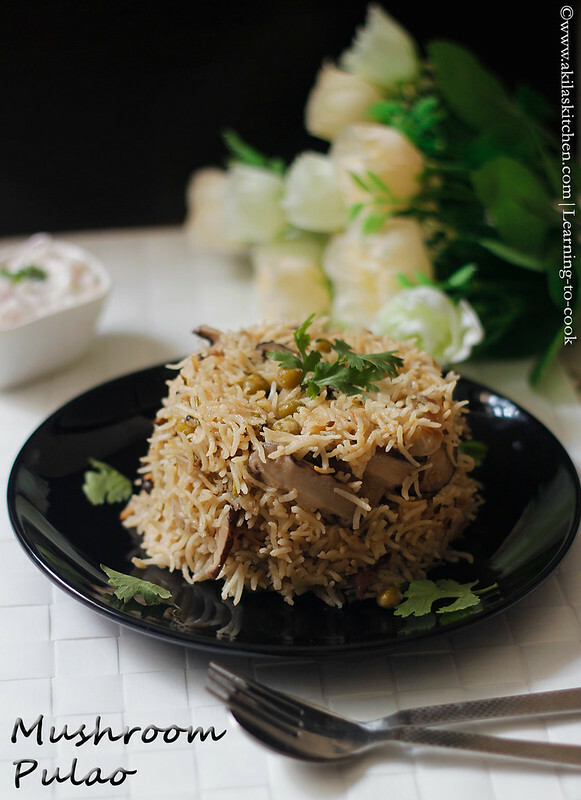 But somehow I have not prepared this mushroom pulao and kept postponing as I love to eat the mushrooms in gravy with blend of masalas than in biryani or in pulaos. 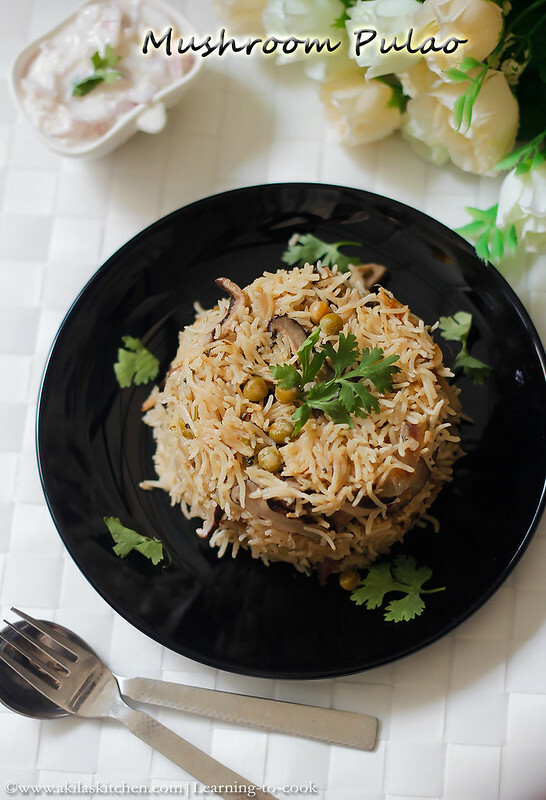 Finally one fine Saturday tried this mushroom pulao along with peas and it came out good. Since this is mild in spiciness, my kids loved a lot. Serve it with Brinjal raita or Vegetable Raita. I served it with simple onion raita. If you want to try different and easy pulaos check out the below ones. 1. Add oil in the pressure cooker. When it is hot add the spices and fry for a min. Add the onions and fry till soft. 2. Add the ginger garic paste and sauté till the raw smell goes off. Add the mint and coriander leaves and fry till nice Aroma comes. 3. Wash and add the mushrooms to the cooker. 4. Add the green peas and add 1 tsp ghee and fry them. Add the coconut milk and water and allow to boil. 5. Add the soaked rice and mix and close the lid. Change the flans to low. Cook for 10min and switch off the flame. Once opened add 1 tbsp ghee and mix gently not breaking the rice. 6. 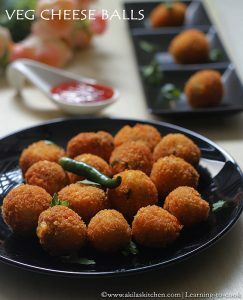 Serve them hot with onion raita or vegetable raita. 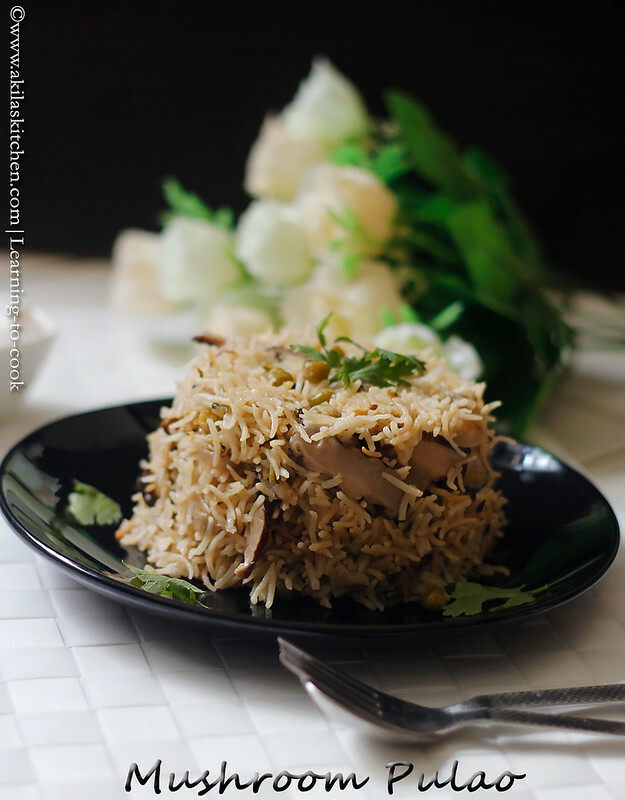 Yummy and easy Mushroom Pulao is ready to be served. tasty one pot meal.. yum!